This statement lingered in my mind throughout the day. It was reminiscent of a wonderful keynote address that I heard at an early childhood conference a few years ago. The speaker was the astrophysicist and director of New York City’s Hayden Planetarium, Neill deGrasse Tyson. His speech was unlike any other keynote that I’d heard before and I literally got goose bumps listening to him. His major point was that when he, or any other executive, interviewed a potential worker, he was never interested in the persons test scores or grade point average from high school or college. What he looked for in a candidate was the ability to think creatively and, as he said, “out of the box”. He also looked for someone with good social skills. Schools today are being pressured to place their major emphasis on prepping students for standardized tests and pushing them towards reaching some predetermined reading levels which MUST be met by the end of the school year. Perhaps high test scores and reading levels can be achieved on a yearly timeline but at what cost to the child and to society? If we consider the wise words of Mr. Tough and Mr. Tyson, we might question whether or not we are really preparing children to be successful adults when we implement curriculums that drain them of their creativity and eliminate opportunities for activities that encourage and enhance the development of social skills? When I first saw this video of Caine’s Arcade on the Internet, it provoked me towards considering these thoughts: How did Caine think up this incredible project? What allowed him to stay with it for such a long time? What might have prevented him from (no pun intended) thinking out of the box? How can schools support this type of thinking and stamina? Could Caine have thought this up, worked through problems and produced this marvelous project if he had to keep to a timetable for completing it? This entry was posted in Investigating Choice Time: Inquiry, Exploration, and Play and tagged Caine's arcade, Neal de Grasse Tyson, NPR, Paul Tough, thinking out of the box on September 13, 2012 by Renee. Exploration is what you do when you don’t know what you’re doing. That’s what scientists do every day. If a scientist already knew what they were doing, they wouldn’t be discovering anything, because they already knew what they were doing. This week, I received emails from two teachers, each asking for advice and information about Choice Time. They want to know what kinds of Choices to offer, systems to keep Choice Time from becoming chaotic and unfocused, how often to schedule Choice Time, what they should be doing during Choice Time, how many choices to open at one time, etc. These are all important questions that I want to answer so as to give these teachers as much support as possible. But, that said, I think that it’s important to first explain why I value Choice Time and why I spent so much time planning for this part of my kindergarten and first grade curriculum. Choice Time provides a point and place, during the school day, for children to make sense of the adult world. So much of what happens in the classroom today is driven by a standardized, scripted curriculum. Teachers are bound by pacing calendars and quantitative assessments. Because of these mandates, children have less and less opportunities to make decisions, even down to being able to chose what they will be writing each day. That is why it’s important to provide time for children to explore, theorize, create, and experience the frustration of learning through trial and error. My ideal Choice Time involves an active teacher who, by listening closely to children’s conversations and monologues, becomes aware of many of their understandings, misunderstandings and wonderings. This invaluable insight into their world provides the teacher with the seeds for planting future classroom dialogues and inquiries. In planning choice time centers, I would suggest keeping in mind your big goals for the year. I wanted children to develop independence and self-confidence. Making interdisciplinary connections and beginning to generate personal lines of inquiry and exploration is another important goal. I provided many opportunities for children to use reading, writing and mathematics in ways that would support their own, self-directed projects and activities. Children should understand that they could use classroom equipment and materials in new and innovative ways. There should be many opportunities within the center for children to expand and deepen their use of language to express ideas, discoveries and confusions. When there was a sense all of this happening, then I knew that I was on the right track and my Choice Time was becoming successful in meeting my goals. In setting up choice time centers, I planned to leave opportunity for children to ‘set their own agendas’. In September, the centers were usually rather basic: blocks, dramatic play, play dough, an art center, water explorations, a science table perhaps with shells to explore. These were a few of the possible early centers. 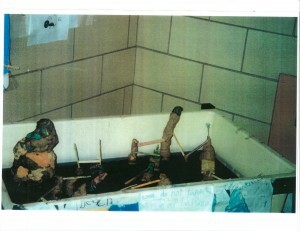 As the year proceeded, centers became more focused on the children’s particular interests and on class inquiry studies. For example what began in September as ‘water explorations’ might possibly become a ‘water-machine invention’ center where children were experimenting at constructing water machines. At the playdough table, instead of making traditional flour and salt playdough, children might be creating their own innovations on the traditional recipe, adding sand or sparkles to the batter to see what would happen. Generally, there wasn’t a specific ‘task’ to be completed although, sometimes, there might be a particular focus for a center. For example, one year when my class was studying the waterways in New York City we read about landforms and how they affected the creation of these waterways. This topic fascinated many of the children and they asked if they could use our sand table to make their own landforms using the Plasticene that we had in our art studio. I emptied the sand from the table and each day a group of children went to work on this project. There was a big basket of reference books and some photographs of landforms such as mesas, buttes, mountains and valleys. The children decided on how this project would proceed and, on some occasions, a few disagreements erupted, such as on the day when Alex decided to add spikes to her butte. She adamantly insisted that buttes had spikes. When the children came complaining to me about this, I suggested to Alex that she defend her decision to add spikes by finding some pictures of buttes in the book basket. I walked away and left the group, hoping that they would come to some mutual agreement. When I came back, I saw that the other two children, looking through the photos with Alex, convinced her that the buttes should be ‘spike-free’. Through their dialogue, conflict, and rhetoric the children pulled apart an idea, experimented with different strategies and eventually arrived at a point of compromise and satisfaction. There’s so much more that I will be writing about Choice Time in future entries…helpful routines for making it run smoothly, ideas for new centers, the role of the teacher during choice time, assessing the work that the children are doing in their centers, dealing with problems like scheduling and clean up time, making connections to the curriculum, how it looks different across the year and from grade to grade…and any other choice time questions that come up over the course of the year. CLICK HERE to make a comment. I invite all readers (teachers,students, parents, grandparents, etc.) to leave comments. It would be wonderful to hear what you have to say so we can have more of a dialogue on the subject. This entry was posted in Investigating Choice Time: Inquiry, Exploration, and Play and tagged centers, Choice Time, create, curriculum, dialogue, explore, first grade, goals, inquiry, interdisciplinary, kindergarten, mandates, Neal de Grasse Tyson, pacing calendar, Plasticine, playdough, quantitative assessments, school day, theorize, trial and error on September 12, 2010 by Renee.